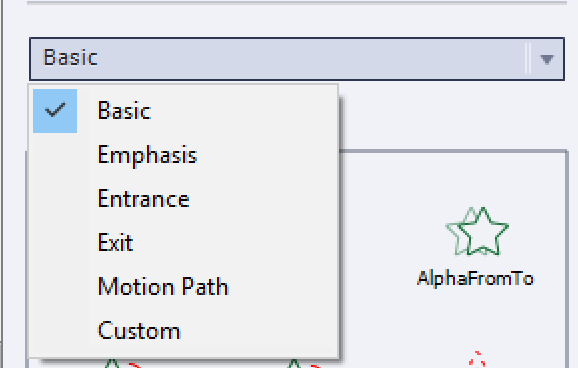 Using the On Enter event to trigger an advanced action, which will use the Play Audio command based on checking which visit it is to the slide. 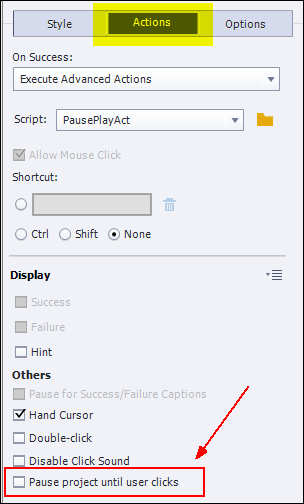 It is an easy workflow, with one drawback: for the Play Audio command it is not possible to use the Closed Captioning feature packed with Captivate. 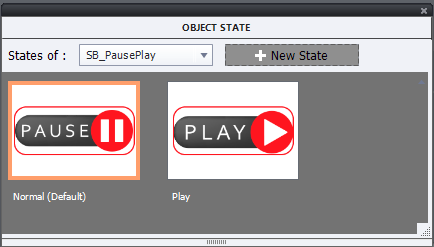 Since Closed Captioning is only possible with Slide audio, this alternative workflow will use micro-navigation to jump to a frame after the end of the audio timeline. If you didn't read my introduction to Micro-navigation, please use this link. 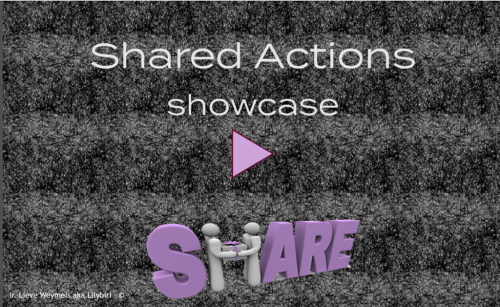 Both workflows can be watched in this interactive movie. Be sure to check out later visits by using the Back button. 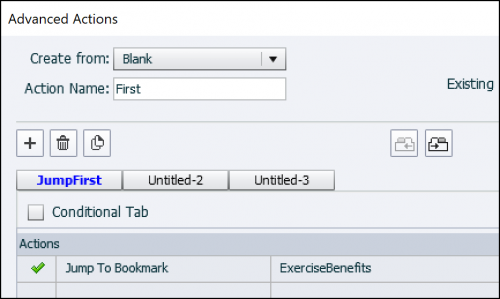 As explained in the previous post, we'll need a tracking user variable. 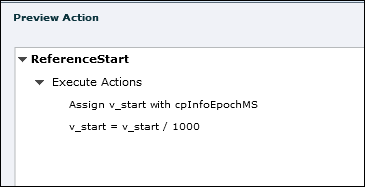 It starts with a default value of 0 and is incremented with each visit to the slide. 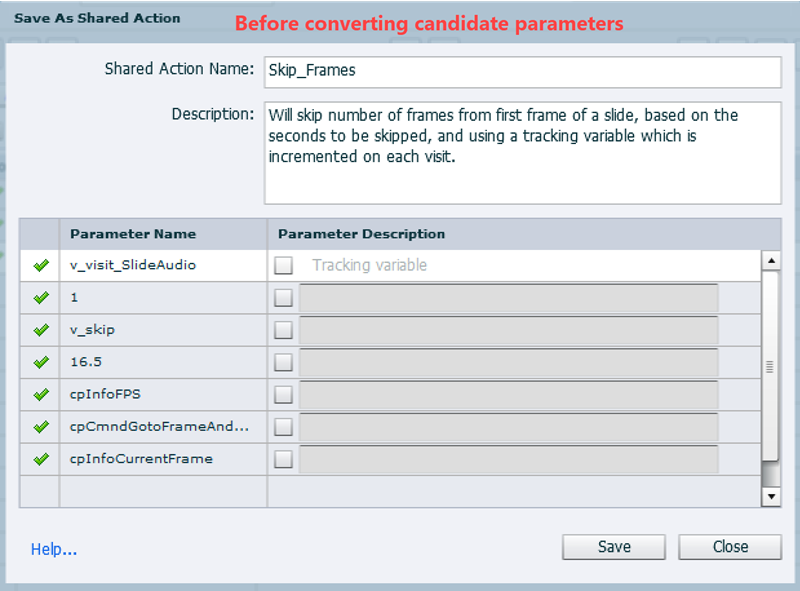 TrackVar is not conditional, will increment the tracking variable (which started at 0). 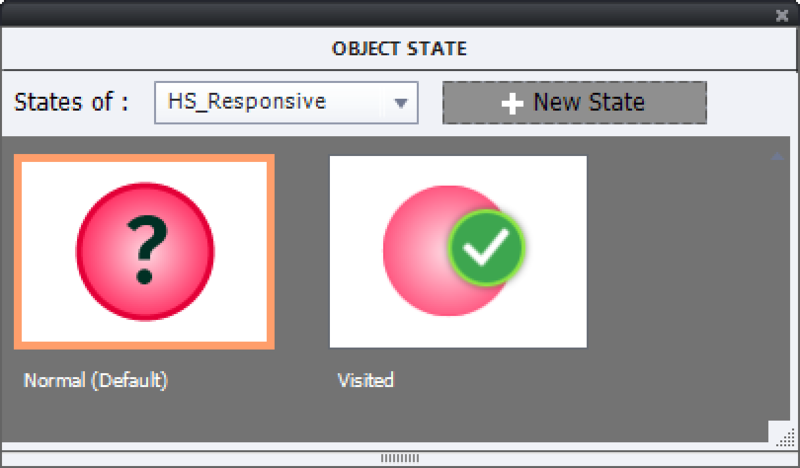 CheckVisit checks the value of v_visit_playaudio. If the value is greater than 1, which means it is not the first visit, nothing will happen (Continue), if it is not greater than 1, which means the first visit, the audio clip will be played. The Next button appears at 16,5secs. If the visit is not the first, all frames in 16,5secs have to be skipped. 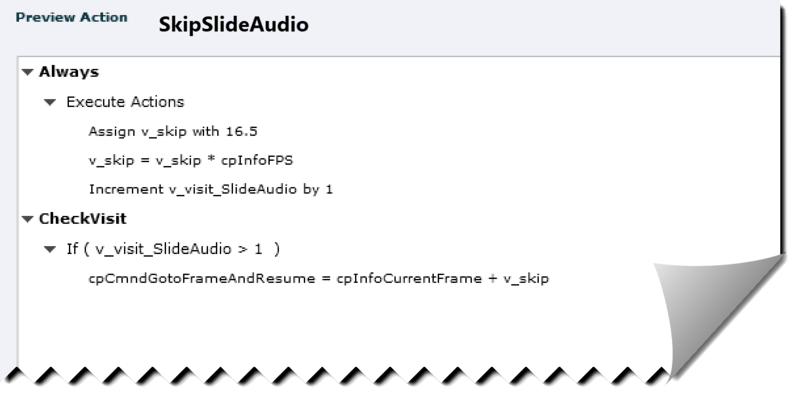 We need a tracking variable, which will be labeled v_visit_SlideAudio. 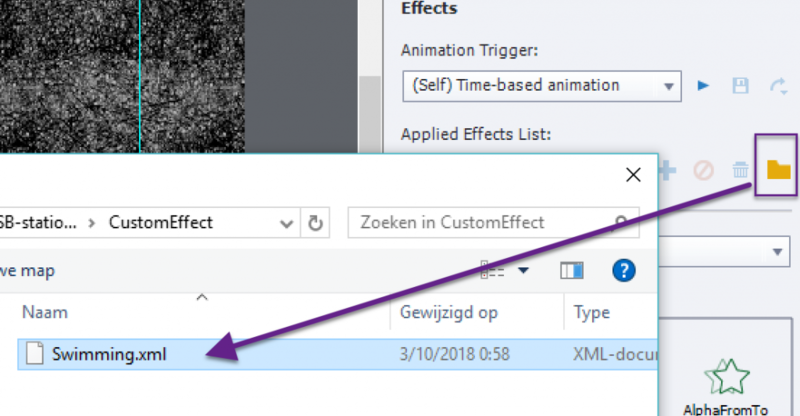 It is not possible to reuse the variable which tracked the visits to the previous slide where workflow 1 (Play Audio) was used. I suppose free navigation is possible, hence tracking visits will need a variable for each slide where you want to use the workflow. 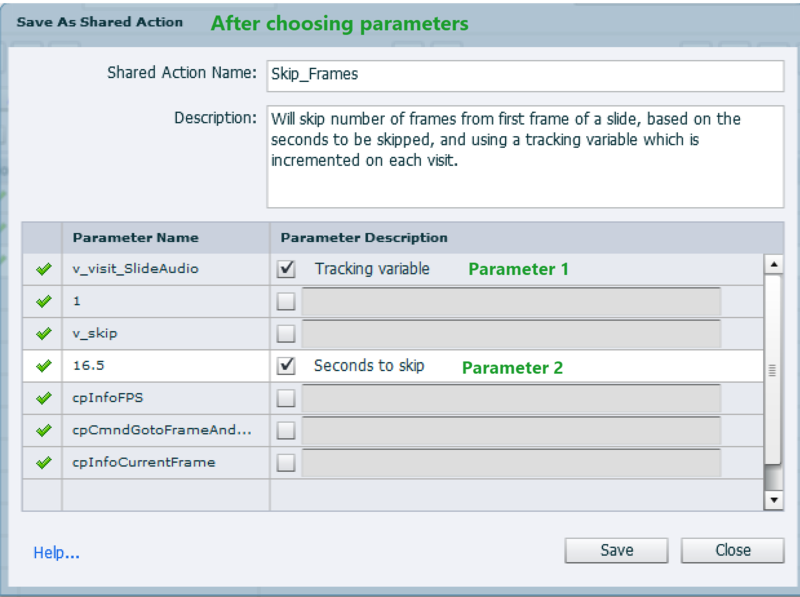 However, the variable v_skip, which is used to store the number of frames to be skipped, can be reused for each slide where you want to use this second workflow. It doesn't matter if you want to skip part of the slide to avoid an audio clip to be played the second time, or to avoid that animatios are playing the second time. 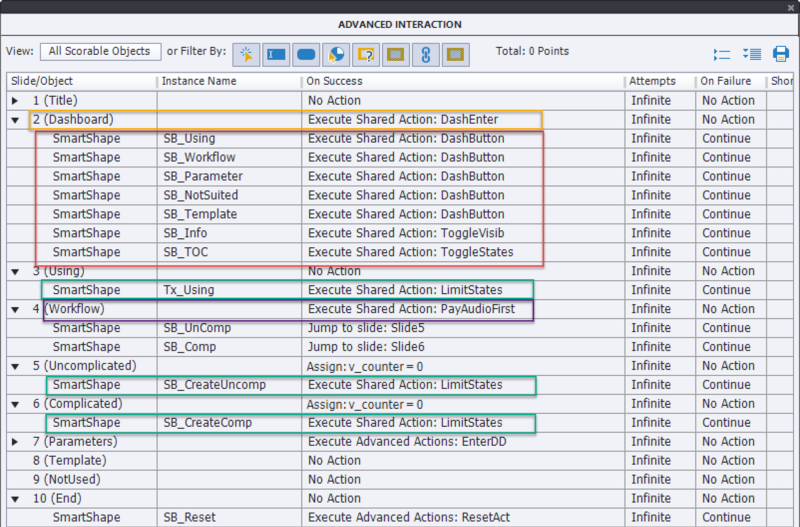 As you see in this screenshot, the advanced action looks very similar to the one in the first post 'Force first view'. 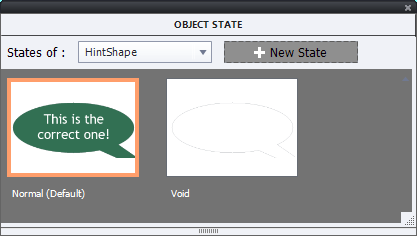 It is so similar that it was possible to create this action as a duplicate from the one in the post 'First View'. 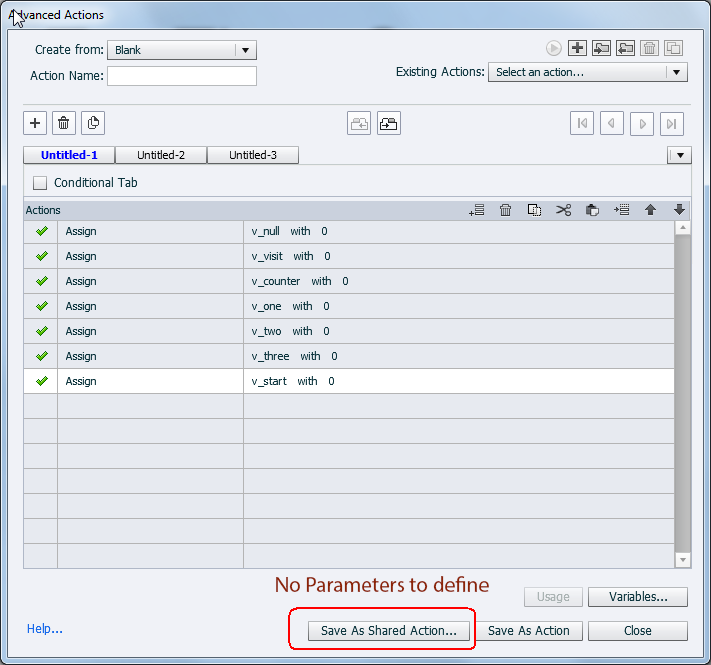 If you are not familiar with duplicating an action, have a look at Advanced Actions Dialog Box. 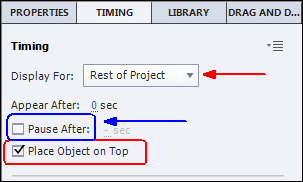 Change the advanced action so that the same action can be applied to both situations? 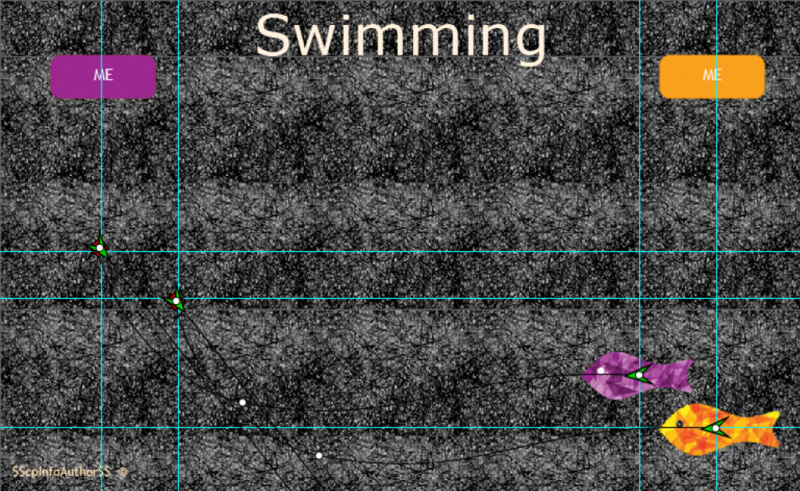 There are two differences in the situations: the literal which is the duration in seconds to be skipped (was 10sec in the first post, 16,5sec in this timeline) Second difference is the tracking variable. For the literal a solution could be found, but that is not the case for the tracking variables because they have to be unique for each slide. This approach is not possible for the present situation. 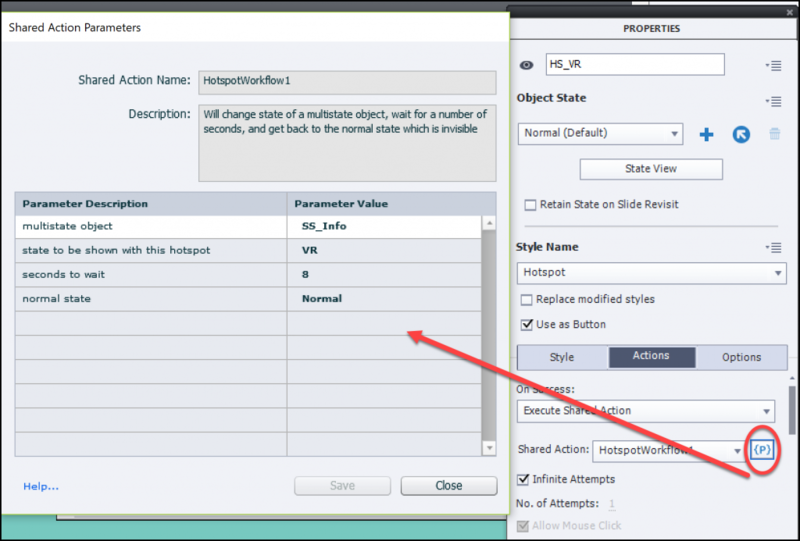 Convert the advanced action to a shared action, with as little parameters as possible. 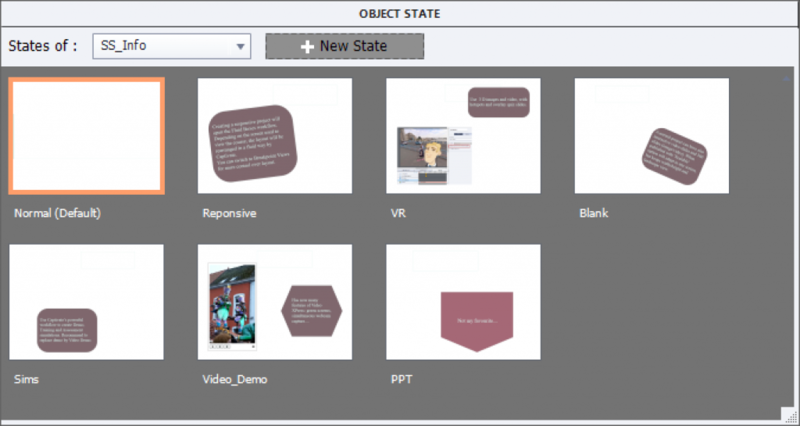 That would also make it much easier to transfer the action to future projects, and as you learned from my webinar (see summary in this interactive movie) due to the presence o the shared action in the Library, much easier to manage. 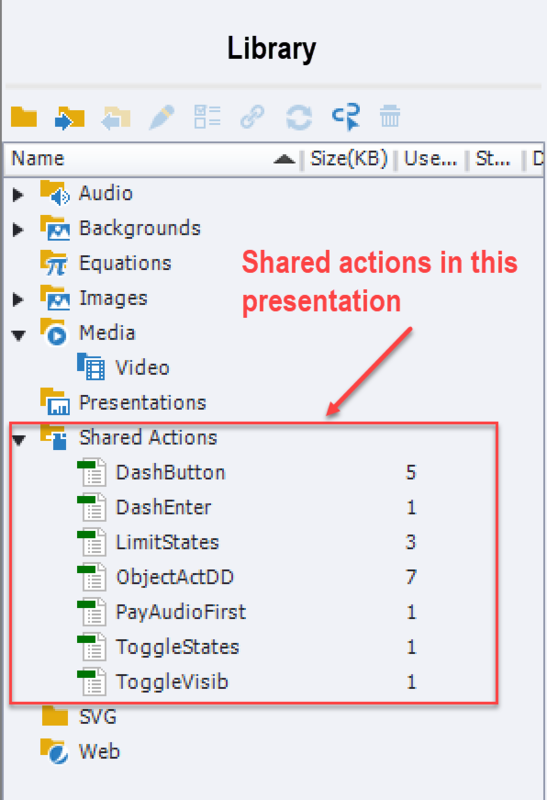 How to do the conversion and use the shared action, will be the topic of my last post in this sequence.